The morning bus to Taipa Village took some 20 minutes and we stopped at a small square. To our surprise, there was a Wallace Fountain and it was providing cool refreshing water. Buy a bottle later to fill up. As we navigated to Rua De Cunha, we passed a very familiar shop. I was hungry and wanted to test the egg tarts so raved about by travelers to Macau. We got an easy seat and on came the tarts. 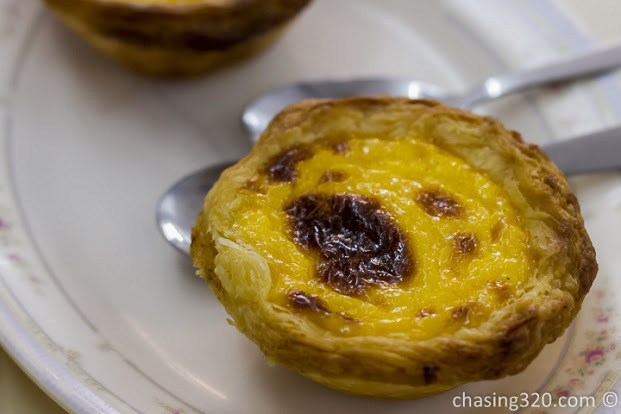 Ordering the evaporated milk egg tart, the bird’s nest egg tart and the original Portuguese egg tarts. Enter the shop and watch the tarts baking……..
One order of pork chop bun please. The egg tarts arrived fresh and after my customary photos, I started eating the Portuguese egg tart. The flaky buttery crust combined with the textured filling of egg was a match made in heaven. How can something taste this good??? The star was probably the crust with its fresh flaky and lightly salted butter aroma. This complements the sweet egg tart filling perfectly. Take a look at the egg filling. Textured and home made looking with its bumps and dimples as compared to the commercially prepared flat texture-less look of common egg tarts. The bird’s nest egg tart was sweet and had some bird’s nest filling but this was something worth to try once and skipped on future visits. So too the evaporated milk egg tart. The other surprise was the moist pork chop that came with a lightly toasted bun. Fresh and moist. There are many places that serve dry pork buns but this one is an exception. This shop’s would rank as the number one Portuguese egg tart in my opinion by the end of the trip.